The Australian Bureau of Statistics has released its latest Construction Work Done figures for the December quarter. Not surprising, residential housing activity looks to have peaked and should soon begin to decline. Broadly speaking, it’s fair to say that the story we have been telling on house prices hitting the economic data is starting to show. 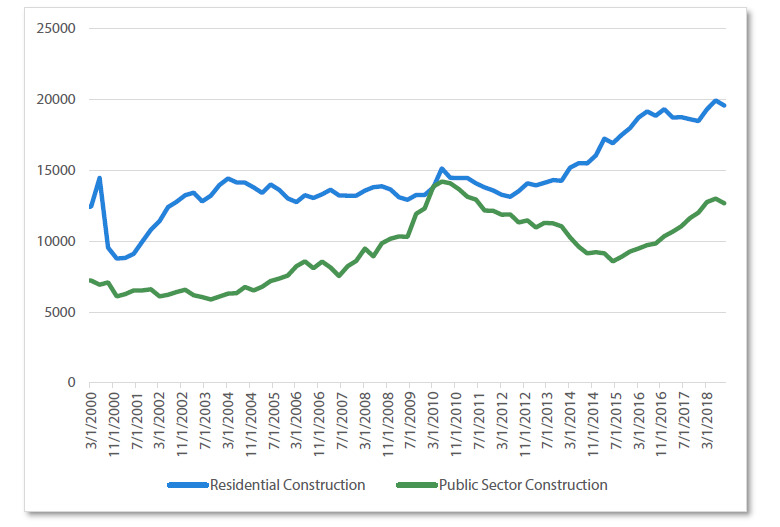 Residential construction posted a 3.6% decline while non-residential construction rose by 1.9%. Let’s take a closer look at what these numbers mean. 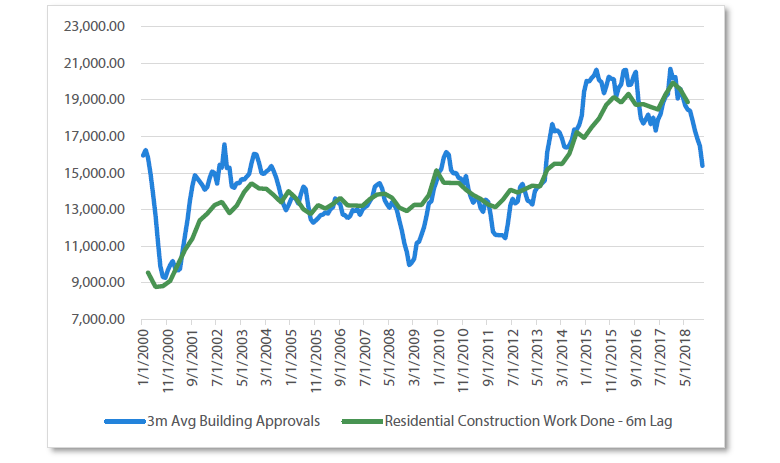 Below are the residential construction figures against building approvals, showing that residential construction activity typically follows the building approvals by about six months. 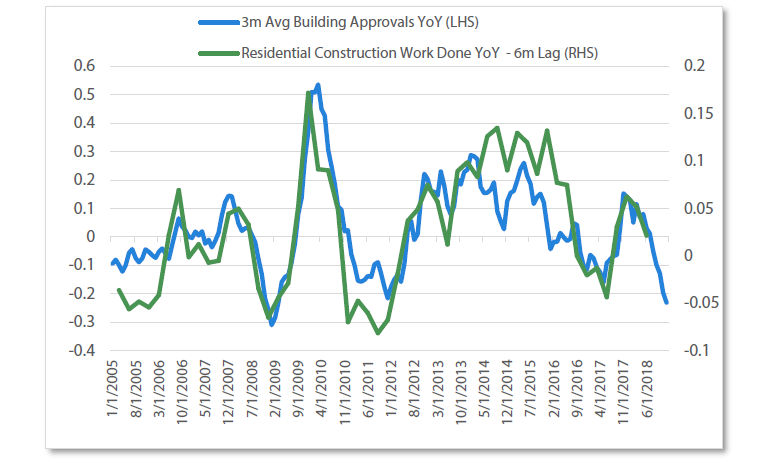 The sharp declines in building approvals indicate the beginning of a larger drag that is set to begin next year. 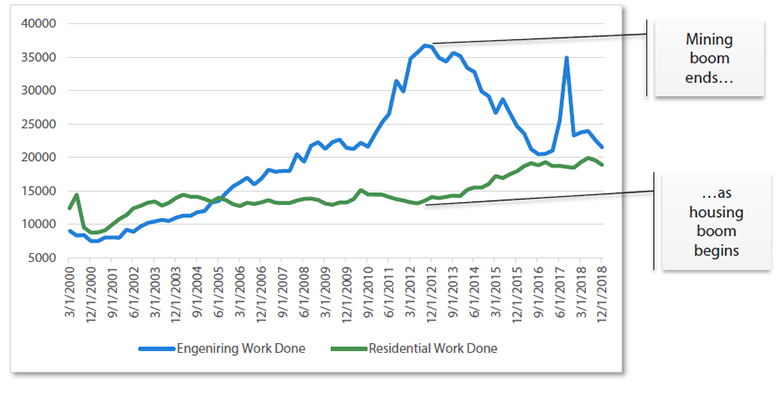 Chart 2 shows the outright level of residential construction, which seems to be heading towards a ~20% decline in 2019. When examining the break-down of construction work done, it’s useful to look at engineering (read mining) and residential. Chart 4 shows how the mining boom delivered a huge amount of construction, which ended in 2014 and levelled out in 2017. The offset to the mining boom ending in 2014 was a huge pickup in residential construction, with this sector increasing drastically from 2014 to 2017. 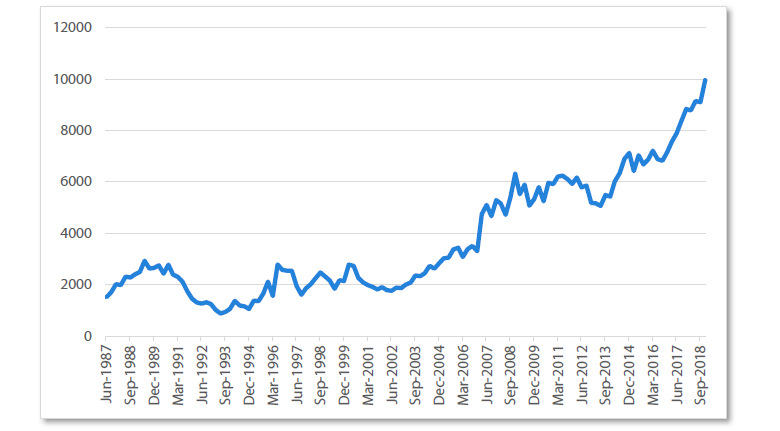 The latest house price/building approval data would suggest this is about to come to an end. If we don’t see another sector pick up the slack, it’s likely we will see consistent drags flowing into the GDP figures. Another interesting point to consider is the private and public construction breakdown. Quite often we hear that infrastructure will offset the decline in housing. However, Chart 5 tells a different story. 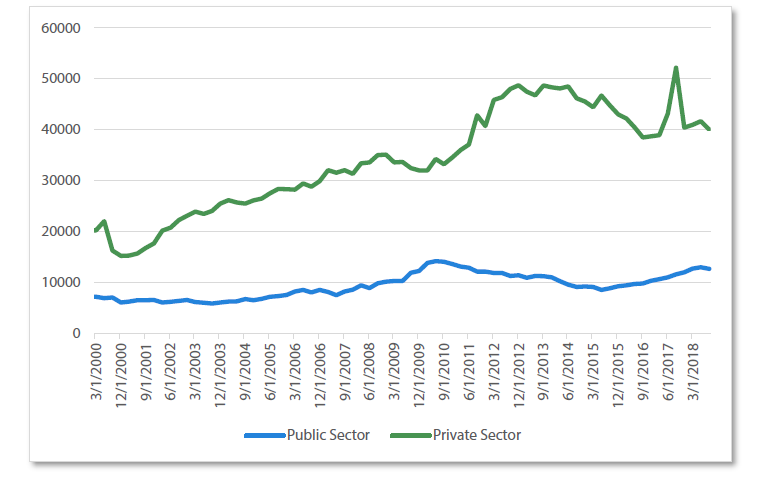 It shows that the private sector is far more important than public. In fact chart 6 shows that residential construction alone at over $18bn is almost two times as large as the total public construction of $12bn. As housing begins to contract, the engineering sector will need to pick up some slack to ensure the private sector construction figures remain intact. What the construction figures also show is that this is more than just a residential issue. If you look at the construction figures in Table 1, you can see they were down across every sector for the quarter in trend terms. Not quite the recovery they were hoping for. If we look in the Statement of Monetary Policy we can see the breakdown of the ‘non-mining investment’ measure that they have been referring to. Source: Reserve Bank of Australia Statement of Monetary Policy – February 2019. *Includes cultivated biological resources (mainly livestock, vineyards, and orchards), computer software, research & development, and artistic originals. 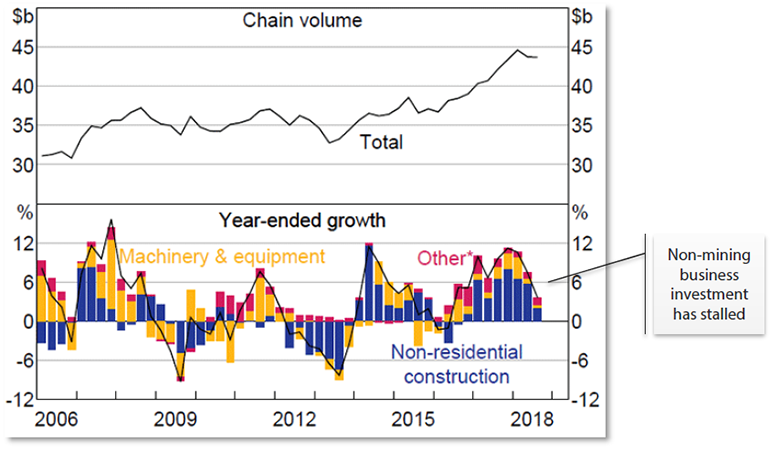 A large chunk of this investment has been coming from non-residential construction, as machinery and equipment has become only marginally visible in the chart. 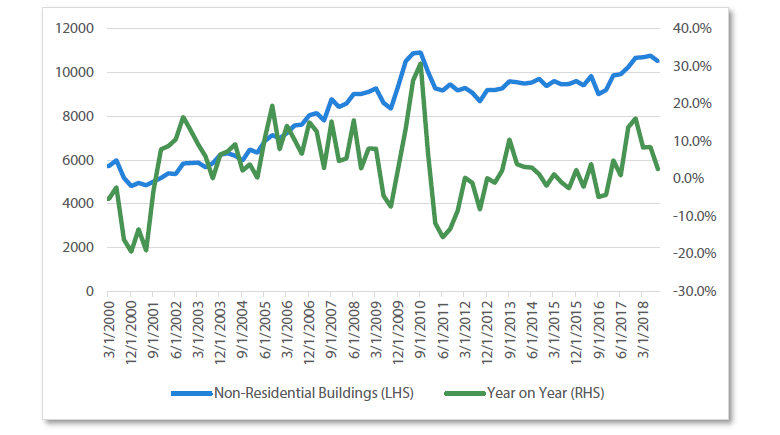 From the construction work done series, the ABS states that non-residential building was flat in the fourth quarter of 2018. While this is not segregated as non-mining investment, it does not reflect the large levels of investment that they had been hoping for. A closer inspection of the recent capital expenditure figures show a somewhat mixed message compared to the construction series. Capital expenditure on buildings and structures in ‘Other Industries’, which excludes mining and manufacturing, was relatively strong for the period with a continuation of the trend since 2013. However, when compared against the total capital expenditure on buildings and structures series, the outright growth in other industries is still being impacted by a decline in mining and manufacturing. 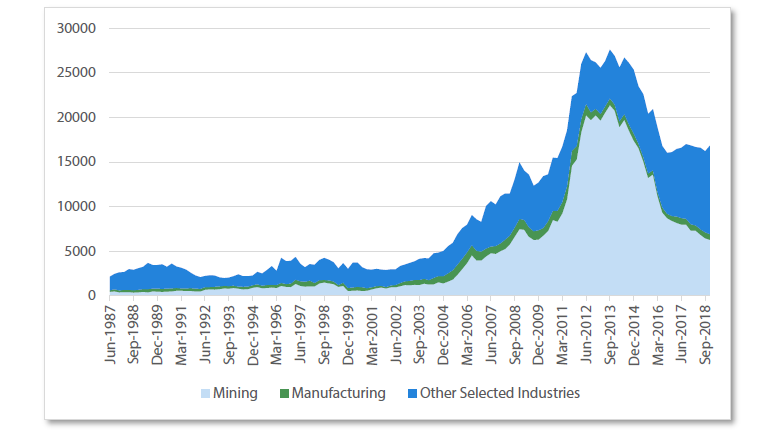 Hence, while the RBA expects the non-mining sector to grow, there is still a drag coming through from the mining sector. None of this is the smoking-gun that would make the RBA cut, as it is one of many components that goes into GDP. But it is another sign that the RBA’s narrative is not quite hitting the mark and that the economy is beginning to show signs of weakness even before the residential effect fully shows up. While we wouldn’t say this data makes a cut more likely, it does reinforces the fact that the lead indicators we have been watching were giving a correct signal. Stay up to date with the latest fixed income news from Nikko AM by hitting the 'follow' button below and you'll be notified every time I post a wire. Want to learn more about Australian fixed income? Hit the 'contact' button to get in touch with us or visit our website for further information.